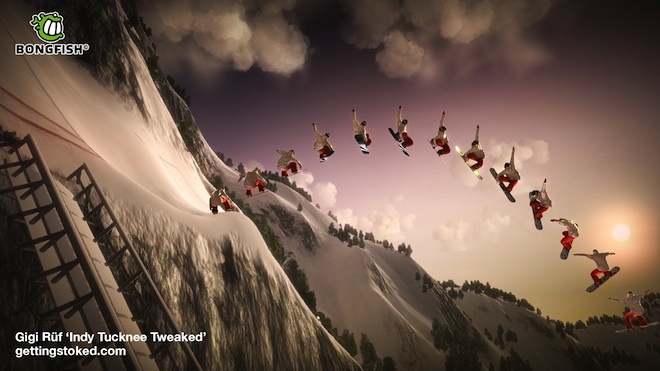 This updated release of the critically acclaimed snowboarding game for Xbox 360 video game and entertainment system from Microsoft has a bounty of new features including racing, marked trails, lots of extra park objects to trick off, two new mountains, better visuals, and a faster and smoother riding model. Stoked gives players physical control of their rider through the analog sticks, which eliminates the need for players to mash buttons or memorize combos, and gives players the ability to craft their own riding and trick styles. 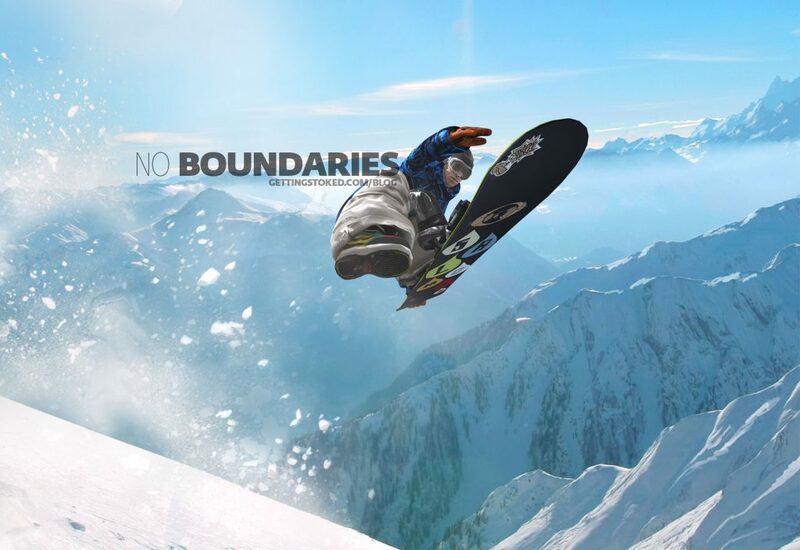 As players complete challenges and win events with style, they gain sponsorships, gear, and clothing from over 30 real-world brands, like Burton, Libtech, Volcom, Dakine, Nikita, and Quicksilver, and they gain profiles of their exploits in leading snowboarding magazines, such as Snowboard Magazine. Race against the world’s top riders in single-player mode or race online against up to seven other players via Xbox LIVE online entertainment network. Three types of races are included: Head to Head Through Gates, Pack Racing Through Gates, and Freestyle First to the Bottom (multiplayer only). All movement is controlled through the analog sticks, with the triggers used for grabs. The tuned and tweaked physics behind the controls help you feel each carve. Define your riding style – fast and sloppy, or slow and smooth. Stoked: Big Air includes all five mountains from the original Stoked (Mt. Fuji, the wilds of Alaska, Chile’s Almirante Nieto, Switzerland’s Diablerets, Mt. Shuksan in America’s Pacific Northwest), plus two new mountains: Switzerland’s Laax and Asia’s K2. Together, these seven mountains give players over 500 square miles to explore. 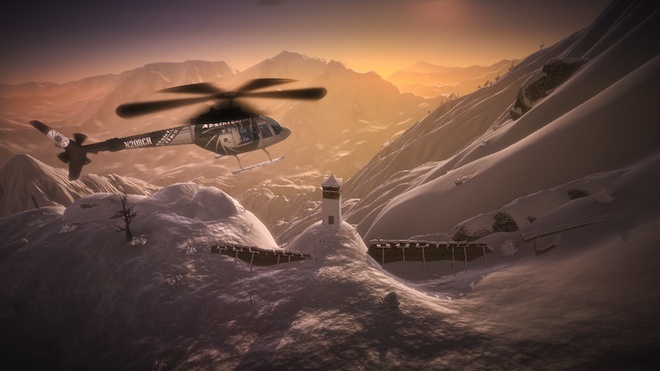 While every mountain has marked and groomed trails, players can also fly their helicopter anywhere to carve their own lines anywhere on any mountain. Invite your friends to ride with you anytime, anywhere through instant drop-in multiplayer. 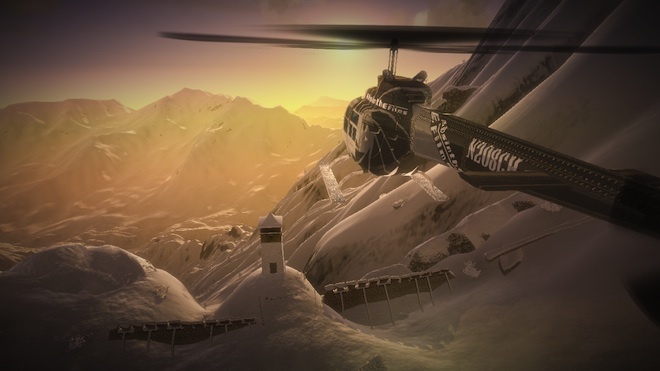 At any time, anywhere, on any mountain, players can instantly choose to free-ride with a posse of up to seven friends, or challenge them in a variety of competitive riding activities. 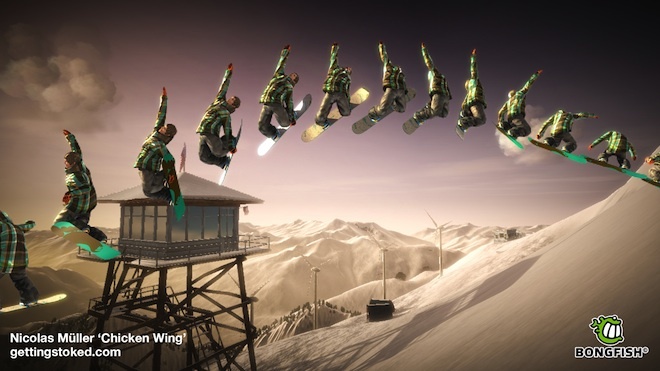 Compete in a variety of Big Air and Grind-fest events. Compete on behalf of a sponsor to take control of a mountain in the Battle of the Brands, ride for media exposure, build a scrapbook of pictorial exploits, free-ride the mountain for high scores, and complete a variety of technical trick challenges. Gigi Ruf and Romain de Marchi join Travis Rice, Nicolas Muller, Wolle Nyvelt, Annie Boulanger, and Tadashi Fuse. Ride with the Pros in the Pro Challenges, in which they match the moves of seven different Pros, or race against them! The weather changes throughout every day, so check out the weather report before you ride. Snow accumulates or melts on mountain surfaces, changing the riding experience, opening new paths, and building new trickable features and access to challenges. Film companies and snowboarding publications in the game include ABSINTHE-FILMS, SNOWBOARD MAGAZINE, METHOD MAGAZINE, SNOWBOARD CANADA MAGAZINE, HUCK MAGAZINE, and ONBOARD MAGAZINE.